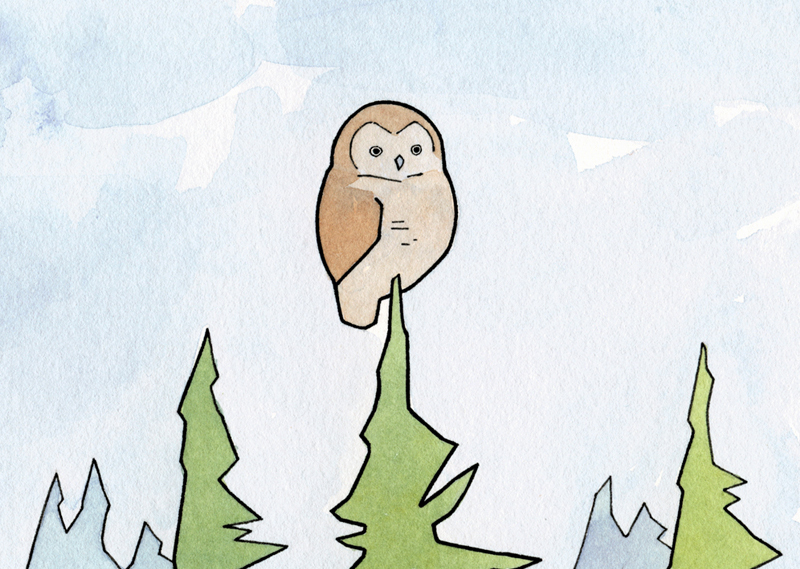 Owl #55 is an updated version of owl #12. I redrew this on on a whim just because I thought it would be fun. I think it’s interesting to see how my style has changed since I started this project. 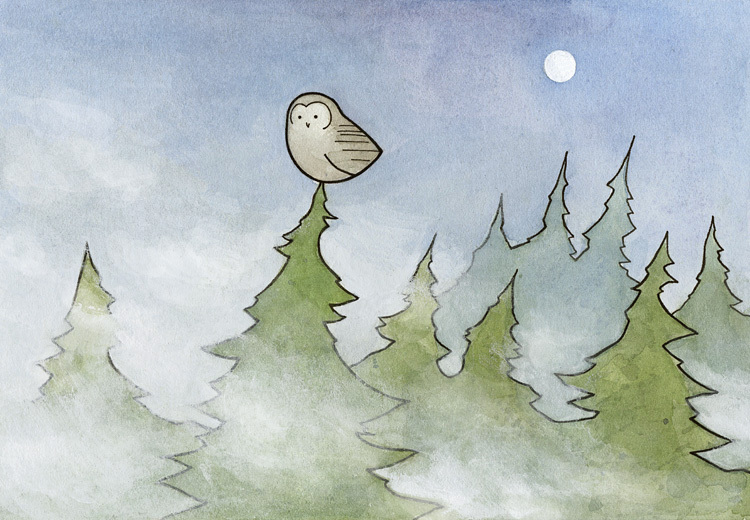 The biggest difference between these two illustrations is how i painted the fog. The fog in #12 was a last minute addition and was painted with gouache over top the illustration. Since the fog in #55 was planned from the start I used watercolor and the white of the paper, which I personally prefer. My owls have changed too over time. They are a lot easier for me to draw now for one thing. Their shapes, still simplified, are much more anatomically correct compared to the early ones – mainly because I just have fun drawing them this way at the moment. A Great Horned Owl up in the evergreens. And under a clear sky, a snowy landscape with cottages lit up for Christmas. Hope you all have a nice holiday season! Owl 53 is another owl found in Iceland, the Short-eared Owl. 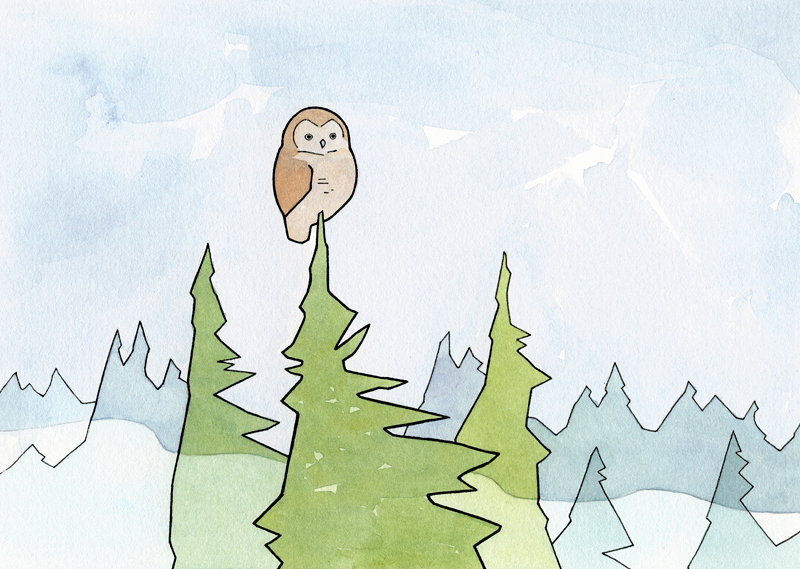 I’ve drawn this one sitting on moss covered cliffs with falling snow. Liking the subtle variations of greens in this one. You can find single cards and card sets in my shop. 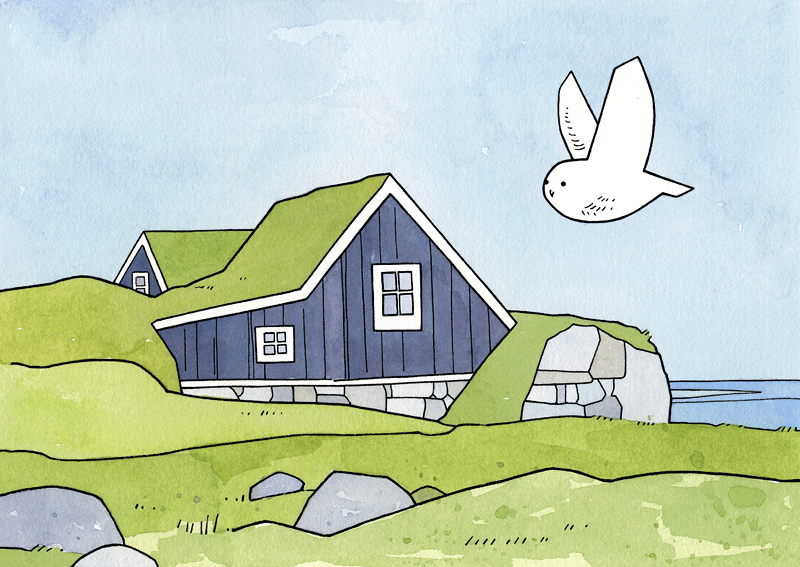 A Snowy Owl flying over a grassy landscape with a small grass roofed cottage. Snowy Owls are one of the three owls found in Iceland. 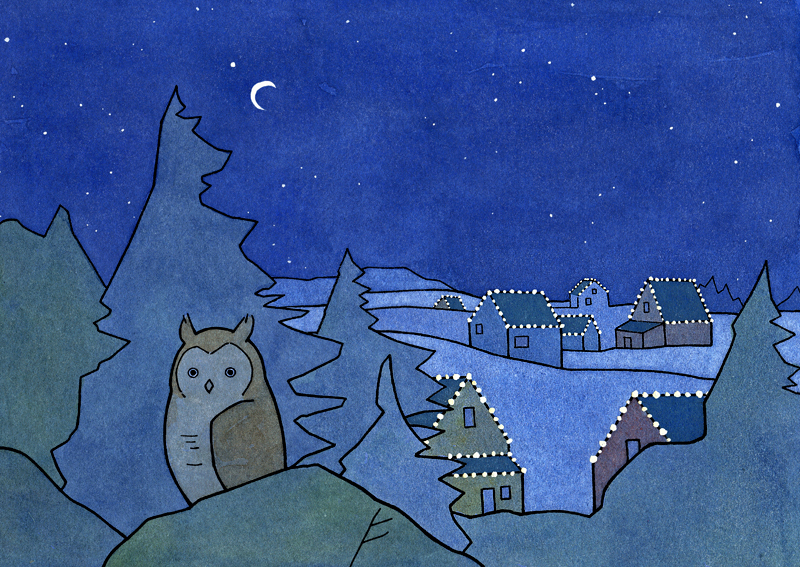 This illustration is the month of March in my 2016 owl calendar. 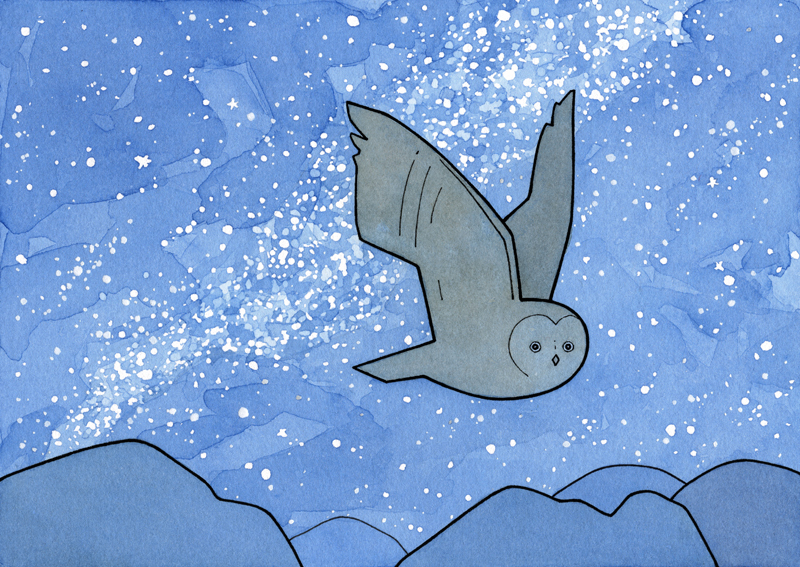 An owl flying across a star filled sky with a band of the Milky Way. India ink and watercolor. Used some masking fluid with this one for the stars and then went back with more watercolor to get some added depth once I took it up – somewhat time intensive but I’m happy with the effect. A grayish Great Horned Owl subspecies, found in the southwest and western US. 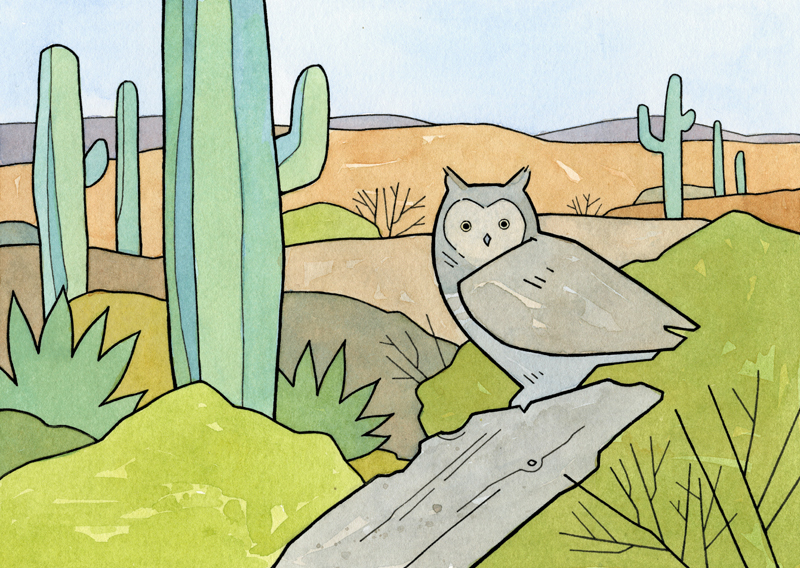 I drew this one in a Southwestern desert, surrounded by Saguaro Cactus, Agave, and Scrub brush. 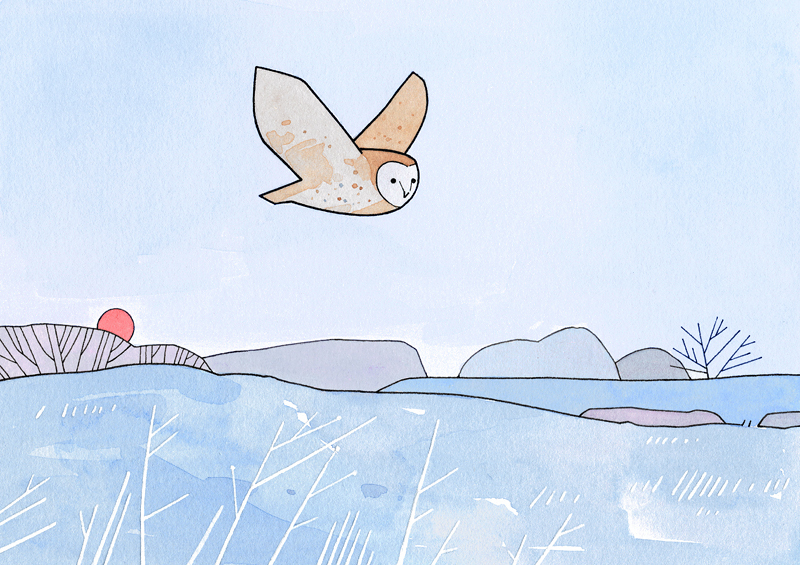 Owl 49 is a flying Barn owl, gliding over frosty Winter fields. Very pleased with how the soft colors and whites turned out in this one. One of my personal favorites that will be going into my 2016 calendar.